This is the easiest to understand, and most comprehensive buyer's guide to LED grow lights that you'll ever read. Today you're going to learn which 5 LED grow lights deserve a spot in any growing setup, and which one of the 5 best LED grow lights deserves a place in your growing-setup. Tips to optimize the performance of your light and maximize your yield. 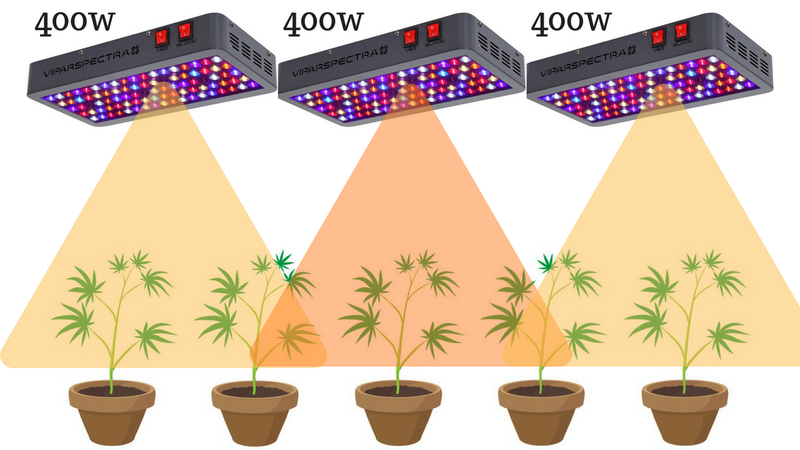 LED grow lights are evolving at a fast pace. What was best 2 years ago, is now replaced with a new LED technology. And when talking about new LED technology, the Horticulture Lighting Group LED grow lights are as new as it gets. New technology in LEDs usually means stronger light for less electricity. Well, Horticulture Lighting Group LED grow lights have the highest lumen/watt and PPFD/watt ratio of all the LED grow lights on the list. And this all has to do with diodes that are used in these white-light, quantum boards. Yes, HLG lights are all ‘white lights', and when growing plants, white light is preferred to your regular ‘blurple' light (blurple lights are predominantly blue and red spectrum lights, 90% of budget LED grow lights are blurple lights). Before talking about the new generation LED diodes present in HLG lights, let's understand why white light is always preferred over ‘blurple' light. White light has a high PAR-output in the full spectrum of PAR. White light more closely resembles the sun than blurple light and results in higher quality yield compared to blurple lights. Blurple lights have mostly high light-output in the blue and red wavelengths of PAR. And while blurple lights get the job done, plants grow better under a light that more closely resembles the sun and has a more balanced ratio of wavelengths that fall within the PAR -range (not just blue and red wavelengths, but green wavelengths as well for example). Now you understand why white light is always preferred over blurple lights, let's understand what makes the LED diodes of Horticulture Lighting Group lights so good. Currently (beginning 2019), the Samsung LM301B diodes are the most power-efficient LED diodes you can use to grow your plants, and these are exactly the diodes that you'll find in HLG grow lights. Any LED grow light that makes use of Samsung LM301B diodes is going to be great for your yield and your electricity bill. Produce more intense light with fewer watts than other types of LED diodes like Epistar and even Cree. With Samsung LM301B diodes, you won't only be able to easily create a grow setup with a maximized light intensity and therefore yield, but you'll also do it with the least amount of electricity used, making these LED diodes not only the best objectively in terms of light intensity, but also the best-value-for-money LED diodes that you can get. The only technology that comes somewhat close in terms of PAR spectrum coverage, light intensity, and PAR/PPFD efficiency, is COB LED (chip on board LED). And although COB technology will result in amazing quality yield as well, you can get the same result with fewer watts when using Samsung LM301B diodes. When it comes to LED grow lights with Samsung LM301B diodes you don't have a whole lot of options. 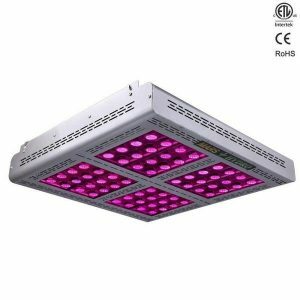 But if want your LED grow light to make use of Samsung LM301B diodes AND want great build quality, run cool and last longer than 1 year, the Horticulture Lighting Group lights are on top of that list. Especially the cooling mechanism and proper spread of diodes are two extremely important factors that can make or break a LED grow light. The passive cooling mechanism of the Horticulture Lighting Group quantum boards is designed very effectively with heatsinks. With most of their models, you probably won't need any active cooling (although it always helps). Combine this effective cooling with the most power-efficient white-light diodes and the right spread of diodes, and you have the perfect combination of grow light features to get an amazing yield while keeping the electricity bill down. The MarsHydro Mars Pro II Epistar is one of the newest LED grow light models of MarsHydro. When comparing the PPFD charts of all the MarsHydro Mars models (PPFD is a measurement to rate a light's intensity and you can read about here), you'll see that the Mars Pro II has slightly better values all over the full coverage area than the earlier MarsHydro models. You get higher light intensity per square meter with this version than the earlier versions. This light is super-affordable. It's the best budget light you can get (expressed both in $/Watts and $/PPFD). 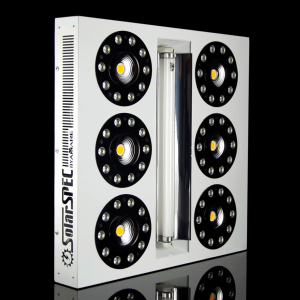 It's a budget-light but has a higher light-intensity than most other budget LED grow lights. You can easily get 2 MarsHydro Mars Pro II Epistar lights, for the price of 1 high-end LED light like one from Amare SolarECLIPSE (talking about same true-wattage lights here). Of course, these lights come with a separate switch for the vegetative and flowering stage, so you won't be wasting any electricity in the vegetative stage especially (you'll need less light intensity and less different wavelengths in the vegetative stage). the far-red spectrum, which is responsible for the Emerson effect. What's the main downside of this LED light? Although the full spectrum of wavelengths which fall into the PAR-range are covered, mostly the red and blue ranges are covered. What this means is that the light output in the green spectrum and the spectrum between red, blue and green isn't impressive. That's why the MarsHydro Mars Pro II Epistar can be categorized as a ‘blurple' light. It's not entirely clear yet how big of an impact these spectra have on the growth and yield of a plant, but if you want to replicate the sun to the best of your ability, you should look either at the Horticulture Lighting Group Lights (#1) or the Amare SolarECLIPSE. Both of these are white lights, and white lights have a high light-output in the full spectrum of PAR (not only blue and red wavelengths). The warranty isn’t the best either (2 years), and the defect-rate is a bit higher than high-end lights. But these downsides don't stop the MarsHydro Mars Pro II Epistar from being the best budget light in the list. A decent quality light for a very modest price. With this method, you'll get an amazing yield. But keep in mind with this method, the coverage area will be WAY below the advertised coverage area and it will cost you quite a bit more. With this method, you'll get a good yield. Again, the coverage area per light here is lower than listed by the manufacturer. If you keep the manufacturer's coverage area in mind, you will get a decent yield, but I hope you're shooting higher than ‘decent'. 5×5 ft. area: get 1x 320/1600W and 2x 160/800W MarsHydro Mars Pro II Epistar lights. It's easier to cover the full area in a proper way when you have multiple lights. If you're looking to replicate the sun, the Amare SolarECLIPSE will get you very close. While 90% of LED grow lights are so-called ‘blurple' lights, mainly providing PAR-output in the blue and red spectra, the Amare SolarECLIPSE is providing a very high PAR-output in the FULL spectrum, including the green spectrum! It has a very balanced ratio of wavelengths, including the far-red spectrum which is needed for the Emerson effect. UV-light has been proven to increase THC-percentages in cannabis, and this is one of the few lights that have an UVB-bulb. This light is a real powerhouse and literally replicates the sun. Don't take my word for it. If you check the PPFD readings, you'll see this light's PPFD values are off the charts. Not only regarding pure output, but also the coverage area. The coverage area of this light is bigger than other same-watt budget lights on the list when using the ‘minimum of PPFD of 510 μmol m(-2)s(-1) for the full coverage area' rule. When looking at the actual power draw of this light, you'll see this light has a very high PPFD output per watt (PPFD/WATTS). The LED chips used in this light are based on COB technology (chip on board). COB LEDs are more powerful and efficient, last longer than regular LED diodes, have a more balanced spectrum of wavelengths, and are much easier on the eyes than specific color LED chips. The main downside of COB is that they're a single-point light source and the spread isn't the best, but Amare counteracted this by providing supplemental CREE chips. 60x CREE XP-G3 & XP-E2 Monos. The Amare SolarECLIPSE has the best build quality on the list. The cooling is really on point, you won't need any additional cooling with this light. plus you get a 5-year warranty in case anything goes wrong. 5-years of warranty is above-average in the LED industry (the average is 2-3 years), shows you how much they trust their lights. The Amare SolarECLIPSE is the light you should get. The VIPARSPECTRA Reflector is similar to the MarsHydro Mars Pro II Epistar light. It’s a Chinese budget light which provides excellent value for its price. The quantity and quality of your yield with these lights will be slightly worse than with the MarsHydro Mars Pro II Epistar (when comparing the same watts per square foot). This comes as no surprise as the light intensity (PPFD) of this light is the lowest on the list (still decent though). The build quality of this light is also slightly worse. But it's also quite a bit of a cheaper light than the other lights in the list! This is the cheapest light on the list. Go cheaper than this, and you'll probably waste money on a subpar light. 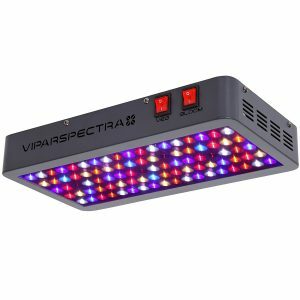 The VIPARSPECTRA Reflector is the cheapest you should go with a LED grow light. Even though the VIPARSPECTRA covers the full PAR spectrum, including the green spectrum, plus the far-red spectrum (for the Emerson effect), when you look at the ratios, you'll see the blue spectrum has the highest proportion of the light's output. What this means is that especially in the flowering stage (in which the green to red spectrum is most important), you'll find this light can disappoint compared to the other lights on the list. So don't be expecting miracles from this light in the flowering stage. 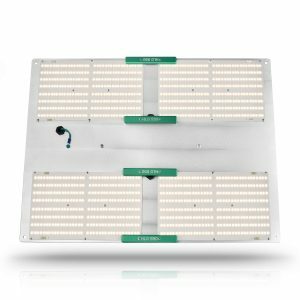 But because its price is so low, you can easily get a few VIPARSPECTRA lights, for the same cost as a high-end light like the Amare SolarECLIPSE (keep in mind that 2 Viparspectra lights still won't give an as good of a result as one high-end light like those from Amare or Horticulture Lighting Group). If you're looking for a budget-light, I still recommend the MarsHydro Mars Pro II Epistar as the number 1 budget-light. 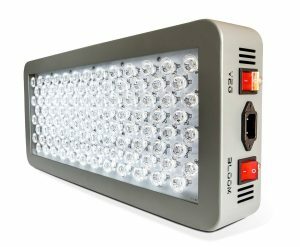 It's higher quality in all aspects, and MarsHydro has been around longer and built a more solid reputation as a manufacturer of budget LED lights. This is the light you should go for. For those who are ready to take it a step up and don't want to settle for a ‘decent' light, let’s continue. The Advanced Platinum LED light is a relatively old light which has built a proven track-record and many fans through the years. We compared many grow journals, and see that with a similar setup, Platinum LED lights provide a slightly better yield (quantity and quality). From this, we can also cautiously conclude that the PPFD values of this light are better than most lights. …or both. In any case, the light is of a slightly better quality, which will result in a more potent yield than the budget lights in this list (the number of watts kept the same). The LED chips used in this light are 3W Epistar and Bridglux chips. When purely looking at it from a chip-quality-perspective, these lights aren't any better than the budget-lights in this list. But when we look at the PPFD-readings at the center, you can see they're slightly higher. You now know that a single center PPFD reading is useless! But the grow journals don't lie; this light does seem to put out a slightly stronger light. These lights also run slightly cooler than budget lights like the MarsHydro Mars Pro II Epistar or VIPARSPECTRA Reflector series…which is great for longevity. You get a 5-year warranty, which is superb in this industry. They're priced as high as the premium lights in this list while being only ‘slightly better' than the budget-lights. Build quality-wise and light intensity-wise, the Advanced Platinum Series is a step up compared to the budget-lights in this list. But, they're also just as expensive as the premium lights in this list, while their quality is slightly worse. So I do feel this light is slightly overpriced. Most lights come with a hanging kit. But if not, you will need a way to hang your lights. These rope ratchets are sturdy as hell. But again, most lights come with a hanging kit! Otherwise, you'll have to manually turn on/off your lights, which is a hassle, trust me. Light is the main ingredient for growing high yield plants. But how can you rate the quality of light? which are the most important when rating a LED light. Let me explain what these abbreviations mean. And although some LED light manufacturers (wrongly) use the term PAR when talking about a light's intensity, PAR is not a way to measure the intensity of your light. PAR is the range for all the different wavelengths/colors of light that plants use for photosynthesis. Full PAR Range. 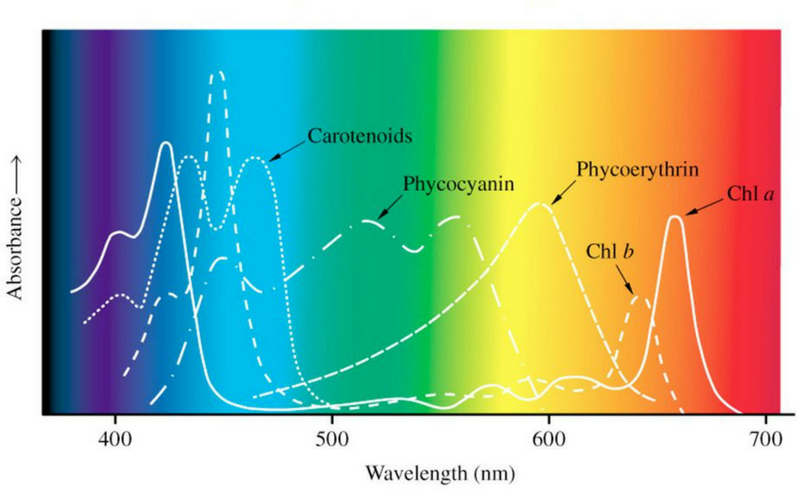 As you can see plants need mostly blue and orange/red wavelengths, but could benefit from some green light as well. The orange/red wavelengths (for the flowering process). Luckily, most LED manufacturers are aware of PAR and design their lights in such a way that most of the wavelengths/colors of light that fall within the PAR-range are present. And the lights in this list have specific vegetation/flowering settings with optimized spectra for that particular stage in the growth cycle. and, you can quickly activate these specific settings with a simple switch. This is also the main reason why LED lights are more efficient than HID lights (HPS and MH). HID lights emit ALL the different wavelengths/colors all the time. This even includes wavelength/colors that fall outside of the PAR range! What this means is that HID lights waste quite a lot of electricity, because they're using power for colors/wavelengths that fall outside of the PAR range and thus are useless for your plants! If you get the right LED light, your light will mostly have the wavelengths/colors of light that fall into the range of PAR and wavelengths that fall into the deep and far-red spectrum (which are essential for the Emerson effect). Your light will largely emit light that's actually being used by your plants for photosynthesis. This way, little to no electricity goes to waste. PAR doesn’t say anything about the light’s intensity (in all these different wavelengths). Your light's intensity is key to rating a grow-light and getting strong plants with monster yields as well. PPFD is a measurement of light intensity, and it says how many light photons that fall within the PAR-range (expressed in micromoles) hit a given square meter per second: μmol m(-2)s(-1). A photon is the most basic and smallest unit of light. Essentially, what PPFD does, is measure the intensity of your light. This means to rate the quality of a LED light, PPFD is one of the most critical metrics. That you should consider when choosing a LED grow light. But PPFD is what mostly matters to your plants. And what matters most are the PPFD values in the orange/red wavelengths, because these are the wavelengths that have the most impact on your yield in the flowering stage of your plants. 255 μmol m(-2)s(-1) – 347 μmol m(-2)s(-1) PPFD on a 24 hours light schedule. 383 μmol m(-2)s(-1) – 520 μmol m(-2)s(-1) PPFD on a 18 hours light schedule. 510 μmol m(-2)s(-1) – 694 μmol m(-2)s(-1) PPFD on a 12 hours light schedule. The guideline above is the minimum PPFD you'll need to produce a decent yield. The range above is the range where your plants will thrive in the flowering-stage on anything except a 24-hour light schedule, but a 24-hour light schedule isn't the best practice anyway. But keep in mind this is the average PPFD value. For optimal results, you never want your PPFD to drop below 510 μmol m(-2)s(-1) and never to go above 1500 μmol m(-2)s(-1) at any given point of the coverage area. Your light cycle: the longer your period of light, the lower the optimal PPFD value is and vice versa. Note: If you don't want to go for anything less than a fantastic yield, you have to realize that LED manufacturers grossly overstate the coverage areas of their lights. Usually at the outskirts of the advertised coverage area the, PPFD drops way below 510 μmol m(-2)s(-1), and this will negatively affect your yield (you'll get airy instead of dense buds). Can a light be too intense? The threshold of ‘too intense' light is above 1500 μmol m(-2)s(-1). The exact value is also dependent on several factors like CO2-levels, your strain, and temperature. But you won’t get very quickly close to threshold with the lights on this list (as long as you respect the minimum height distance as advertised by the manufacturer, more about that later). Note: The most important thing is always to keep an eye on your plants. Look out for signs of stress and light burn, and if you see any, start raising your lights by a few inches. Don't blindly follow the advice in this article or any other article for that matter. Always test yourself! Even if we know the PPFD of a particular LED light, we usually don’t see how it was measured. If you measure the PPFD in the area RIGHT below the light (in the center), you will get different values than further to the sides and corners. The further you get from the center of your LED light, the quicker the PPFD values drop. You will also get different PPFD values if you measure from different heights. The closer you measure to the light, the higher your PPFD will be. The PPFD values are for the different wavelengths within the PAR-range (this one is tricky and is almost never provided, but in an ideal world we would have this info as well). 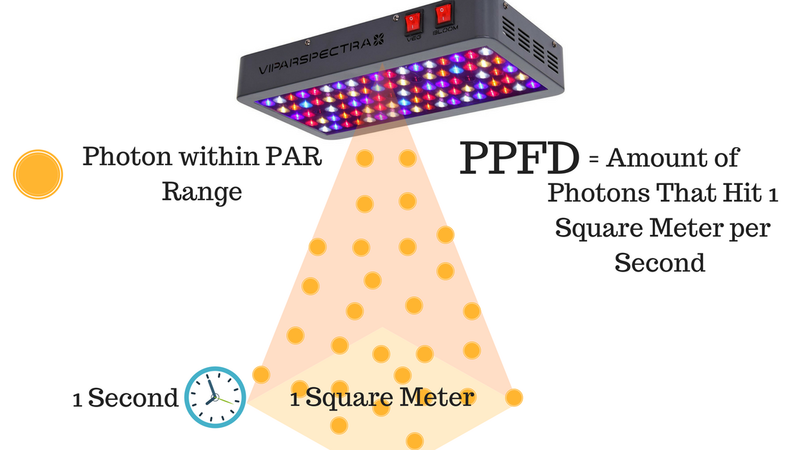 If you have the PPFD values, including all this information, you have a reliable PPFD measurement, and you'll know for sure how one light compares to another regarding light intensity. Most LED light manufacturers don't provide all these PPFD-reading-related background information. Either they provide no PPFD values at all or a general PPFD value, with no background information. A single PPFD value without any background information is useless information, as it doesn’t tell us exactly about the light’s spread, its penetration or even its intensity. If you want an amazing yield, the PPFD should never drop below 510 μmol m(-2)s(-1) in the flowering stage. And as you can see, although the light gets advertised with a 4×4 ft. coverage area, should you grow according to the 510 μmol m(-2)s(-1) rule, it would only cover between 2×2 ft. and 3×3 ft. So always take the coverage area of the manufacturer with a grain of salt. If PPFD isn’t 100% reliable either…what’s left? We don’t wholly toss away PPFD in the garbage can. Although it’s not the most reliable metric because of the often-lacking background information, it does say something (depending on the degree of transparency of the LED light manufacturer). We’re also simply going to have to look at the results of different lights in different growing setups, which means reading and comparing lots of grow journals. And EVEN this rating process has many caveats. You can’t just compare one setup to another, there are countless variables that impact the yield of a grow beside lighting. Nonetheless, when we compare similar grow setups, where only the LED light used, is different, we can very cautiously conclude which LED lights provide a higher yield than others. PAR: which wavelengths have the highest output by the light. You want blue and red wavelengths mostly, but not only! You want the full PAR spectrum, including the greens. Plus the far-red spectrum (which falls outside of PAR). PPFD: are there any values provided for different wavelengths in the PAR-range and do we know how it's measured and calculated. Grow journals: compare the yield of in the same setups, where only the light differs (has many caveats as well!). Scientifically and 100% objectively rating LED lights is quite tricky at this time. If manufacturers brought out independently tested PPFD measurements with all the before mentioned background information, it would be easy. Nonetheless, using PAR, PPFD and grow journals, we can get an excellent idea of the quality of light coming out of a particular LED light. Now you know how at least the quality of light coming out of a LED light should be rated, it’s time you understand how many watts to get for your specific space/setup. Although watts per square foot doesn't say much about the light's intensity, it currently is a decent way to decide how big and powerful of a light you need to get for the size of your specific grow setup. Unless of course, you've got reliable PPFD / PAR value charts, but you probably won't! As a general guideline, you should try to get a minimum of 50 watts per square foot with a LED grow light. This guideline is by no means perfect but will help to get you started. A 400W LED grow light will cover a 2.5 X 2.5 ft space. A 900W LED grow light will cover a 4 X 4ft space. A 1600W LED grow light will cover a 5 X 5ft space. I'm talking about the real wattage value! Im talking about the actual power draw, the actual watts that your light pulls out of the wall. Many LED light manufacturers give their specific model a name like ‘MARS II 400W'. The confusing part here is the ‘400W'. 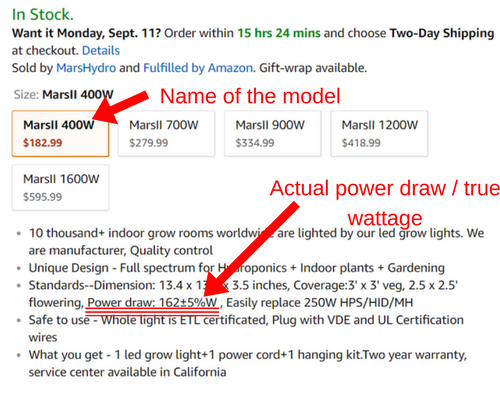 A MARS II 400W does not have a real wattage value of 400. Its actual power draw is 162 watts. So ALWAYS look for the true wattage value/actual power draw of a light. Don't get confused by the name of the light. Note: If there are different true wattage values for vegetative and blooming settings, take the true wattage value of the blooming setting to determine the actual power draw. The minimum of 50 watts per square foot is most important in the flowering stage. In the vegetative stage, you can do with less. Example: This means that with a 3×3 ft. space (9 sq. ft.), you will need at least 9×50 = 450 watts of actual power draw. 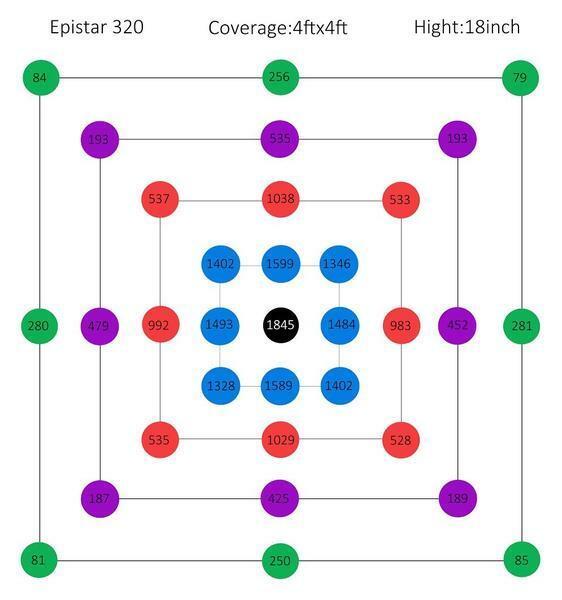 Most lights get advertised with a coverage area that's grossly overstated not only when keeping the minimum of PPFD of 510 μmol m(-2)s(-1) rule in mind, but also when keeping the minimum of 50 watts per square foot in mind. Note: If you get a premium LED grow light that makes use of very power-efficient LED diodes like the Samsung LM301B diodes, you can do with fewer watts per square foot (around 30 watts/sq. foot). What's the bottom line when choosing a specific LED model? Realistic method: You don't have PPFD / PAR-value charts, and you go for a minimum of 50 watts per square foot. The first method will result in a better quality yield but will be more expensive (you'll need more ‘light' to achieve this), and you'll need reliable PAR-value charts which are often not provided. The second method will result in a decent yield and will be cheaper and easier most of the time (most LED manufacturers don't provide PPFD / PAR-value charts…yet). In many cases, it’s better to get multiple lower wattage LED lights instead of getting a single high wattage LED light, and position them in such a way that light from different angles covers your plants. This is because LED doesn’t have the best spread compared to other types of lights, and the more lights you have, the better you can position them and the better the spread of your light will be. It’s crucial that you put your lights as close as possible to your plants, without causing light burn, because this will directly affect the potency of your buds. But it's just as important not to put your lights too close to your plants. This is highly dependent on the light's brand and model. The more powerful the light, the higher the minimum distance between your light and your canopy is. LED manufacturers always provide minimum distances with their products, and you should use these. Lower them when you feel your plants need more intensity. You don’t have to go for a premade LED light. If you’re tech-savvy, you could build your own LED kit. There are many guides and tutorials on the web, which will show you how to build a potent LED light that will be quite a bit cheaper than the premium premade LED lights, but will provide close to the same quality of light. Just prepare and take your time to do all of your homework in case you go this route. Lastly, if you want to connect with us, become a fan on Facebook or follow us on Instagram by clicking the links below.